Archbishop Desmond Tutu called the HIV/AIDS pandemic a "new apartheid" on a global scale. The virus, he said, works in a close alliance with poverty, ignorance, complacency, discrimination, and inequity. Its devastating impact is felt in every country, in every community, in every corner of the globe--but its impact is greatest in areas where inequality rules. This passionate appeal to a sense of justice grounded in an ethic of fairness is vintage Tutu. 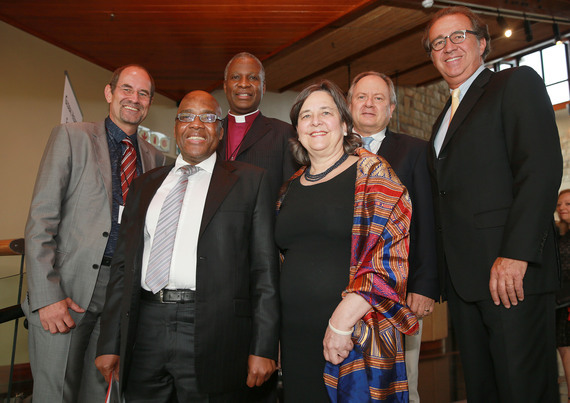 But it was less predictable that Tutu's appeal and religious voice would be invoked by South Africa's Health Minister, Dr. Aaron Motsoaledi. But indeed it was. The minister echoed Tutu's appeal, calling for far more engagement between religious and secular bodies. Noone, he said, should forget that it was faith communities that provided support to those who were affected and infected by HIV and AIDS, providing food, love, care, and concern, at the start and at the end. We will hear much over the next month about the new Sustainable Development Goals (SDGs) that the United Nations General Assembly is expected to bless in late September. The goals represent a global agenda but still more a promise, and universal health care is a centerpiece. Huge disparities in health care are among the most blatant inequities in a globalized world where technology delivers stunning promise, but at a cost that few can afford. Diseases like HIV and AIDS, malaria, tuberculosis, and Ebola are clearly on the map but non-communicable diseases like diabetes, hypertension cardio-vascular diseases, and cancer are increasing at a tremendous pace in every part of the world. The new goal aspires to a comprehensive approach to health. Dr. Motsoaledi was speaking in Cape Town, South Africa in late June to a diverse international group, the Ahimsa Round Table (a multisectoral gathering linking social entrepreneurs and faith-linked health care providers, that I and the World Faiths Development Dialogue - WFDD - helped to organize). In recalling the complex history of church leaders and communities confronting the AIDS crisis, he was making a broader point: "The role of faith-based organiaations in healing, caring, and providing the most basic necessities in our lives, has always been part of our lives, and I dare say, will be part of our lives for ever and ever." Governments alone clearly cannot meet all the health challenges and needs of the populations in any country, the health minister argued. Partnerships must be central and that means a critical role for faith-inspired organizations. Those roles need to be aligned with the priorities reflected in the new SDGs. 1. All faith-inspired organizations should support access to universal health care, meaning that every human being has the right to access to good quality and affordable health care. Access should not be dependent on the socio-economic condition of the individual. And health is not just access to a hospital in moments of dire need. "Health (according to the 1978 WHO Alma-Ata Declaration) is not just the absence of diseases, but it the state of good physical, mental and social wellbeing. The attainment of the highest standard of health is the most important world-wide social goal, whose attainment needs action from all sectors." 2. Faith-inspired communities should deal with the challenges of stigma - especially discrimination in relation to HIV and AIDS, TB, Leprosy, or albinism. 3. Faith-inspired organizations play a crucial role in palliative care - the end of life care - for those who are having chronic diseases that cannot be cured, especially if there is a rise in diseases like cancer and all other diseases that are difficult to cure or incurable. 4. Faith-inspired organizations help to spread the message of a healthy lifestyle - "which is the only affordable way to deal with non-communicable diseases of lifestyle, which are exploding in every nation around the world". We must encourage people to focus on healthy eating, physical exercise - and stop bad habits like smoking, "whilst reducing the consumption of alcohol." 5. Faith-inspired organizations should play an important role in reducing inter-personal violence in society - including abuse of women and children. Supporting the destitute, those who do not have homes, is also part of the work of faith-inspired organizations - which they have done successful in the past - that should continue. 6. Faith-inspired organizations can help governments in caring for the poor, giving dignity to the poor and assist the destitute. This offers a wonderful and sensible to do list. The next challenge is to translate these insights and ideals into practical programs, addressing the myriad institutional challenges that include, of course, finance. But the message is clear: faith-inspired organizations are key players in the health sector and meaningful partnerships can strengthen their role in empowering communities around the world, bringing much needed relief to those who need it most.